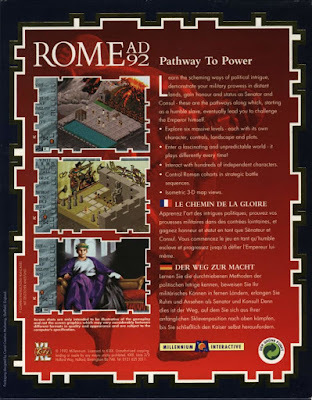 Rome: Pathway to Power is a bit of an odd duck. 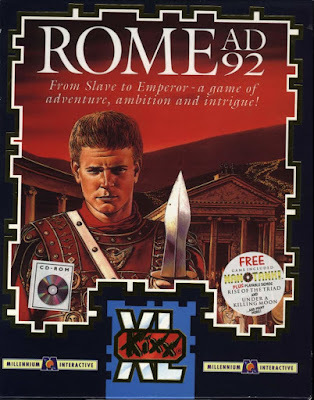 It's a historical adventure set in Rome, of course, in AD 92, which was also its other sub-title. But its main screen uses an isometric perspective, and at least one level involves controlling whole armies rather than just one character. This quirkiness reminds me a bit of the Dune adventure game that I reviewed a year and a half ago, which was a hybrid adventure-strategy game. 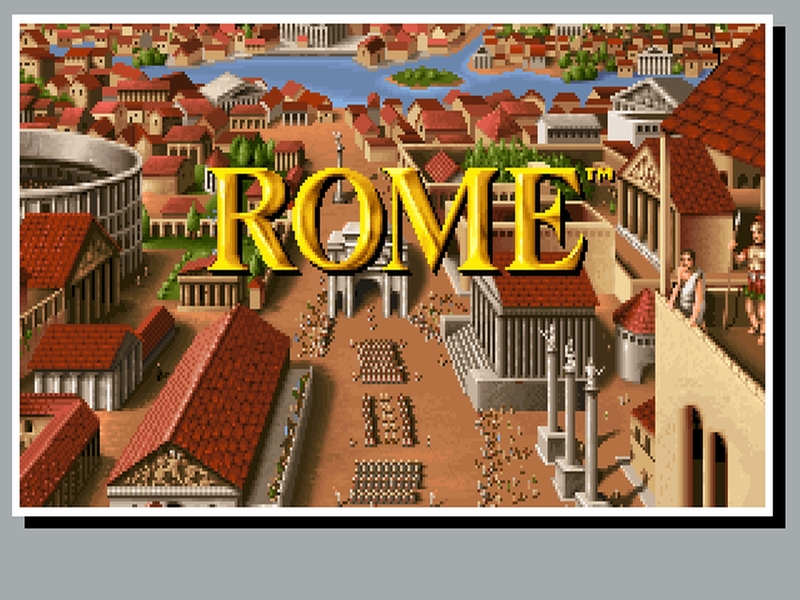 I hope Rome has as good a blend between the adventure and strategy aspects. 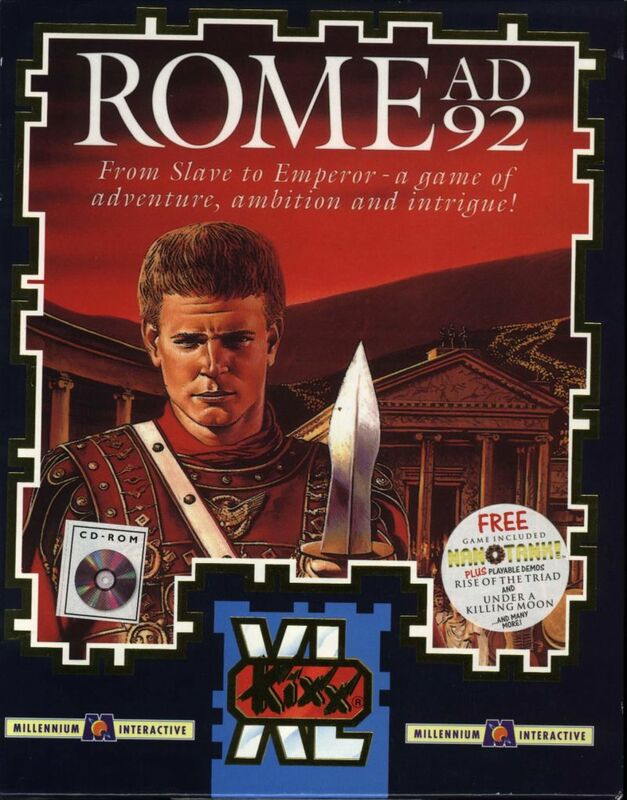 According to the official blurb: "Ancient Rome, AD92 - an era of ambition and political intrigue. You will take the part of Hector in this huge, role-playing adventure. Starting as a humble slave, you have the opportunity to fight your way to the top!" Apparently Hector wants to go all the way and become emperor. That's going to be tricky for a slave. The US cover for the game. The European re-release cover for the game. 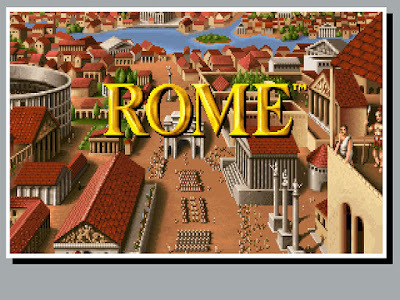 Millennium published Rome in Europe in 1992, first for the Amiga and then for DOS. 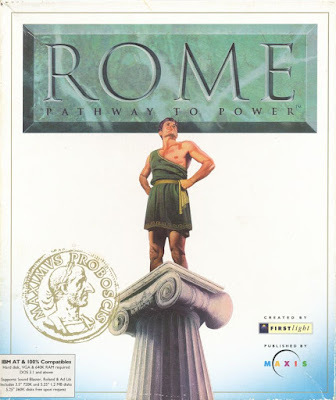 But in the US, the game wasn't published until 1993, by Maxis, a company much more famous for its later Sim games, especially SimCity 2000 (also from 1993). So there are at least two different versions of the box. Then the next year it was re-released in Europe by another publisher called Kixx XL. 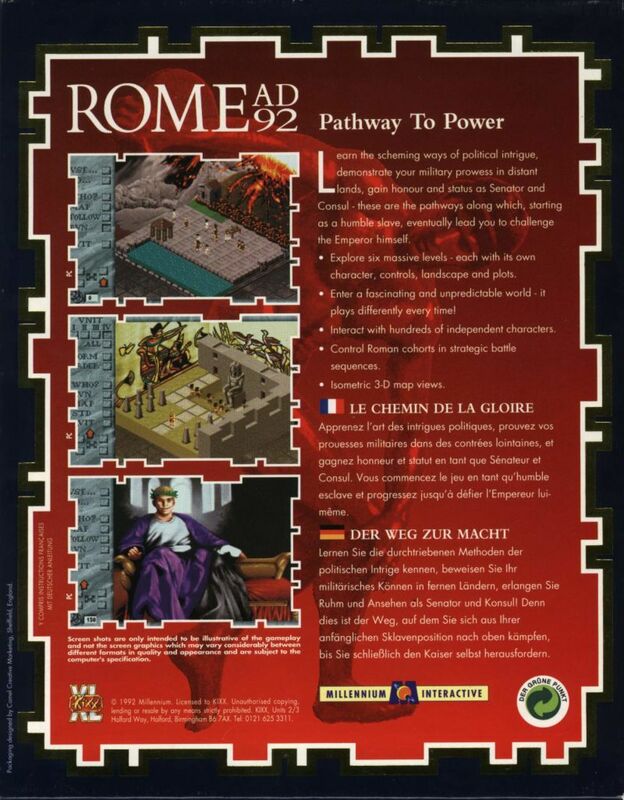 The primary designer was Stephen Grand, who designed the isometric interface used for Rome and Robin Hood. Later he designed and programmed the original bio simulation Creatures. 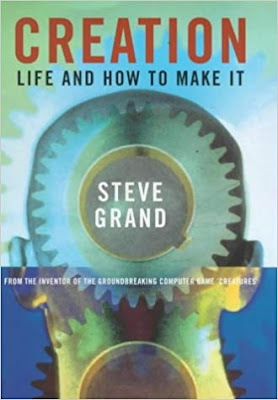 I had trouble finding much about him until I started searching under "Steve Grand" (the programmer, not the country singer, of course). The documentation is credited to Ann Grand, who, I finally determined from his entry on the Creatures wiki of all places, was in fact his wife, but I get the distinct impression they divorced at some point, because nothing even close to recent mentions any family in relation to him. Grand also has published a book called Creation: Life and How to Make It, which is about how he developed his creature AI. AI, especially the kind that learns, seems to be his specialty. I suspect some of his ideas were already being formed when he designed the behavior of the numerous NPCs in Rome as well. I'll have to keep that in mind as I play. Grand's co-designer for both older games was Ian Saunter, who has a long resume of design and production credits spanning over a decade, including some of the Creatures games. The developer is listed as a company called Firstlight, but I can find nothing about them now, as it's too generic of a name. The isometric interface was apparently also used for The Adventures of Robin Hood, an action RPG previously published by Millennium Interactive in 1991. If we were covering RPGs, maybe Alex would have reviewed that one already. I fired up the game in DOSBox and played the first few minutes of the game. The isometric interface is interesting, but it's actually pretty difficult to control. Mostly Hector kind of roams around aimlessly until you tell him where to go, and then he meanders in that direction. Most people move around in real time too, which makes it hard to click on them to talk to them. The area of ground that's visible is very small, too, and it doesn't keep Hector centered. The townspeople react to the volcano's threat. Right away the pressure is put on the player when the nearby volcano begins erupting, and lava begins covering the map from the north. The docks are in the south, with someone who owns a boat offering places on it for three sesterces. But Hector is a slave and has no money. How will he escape!? 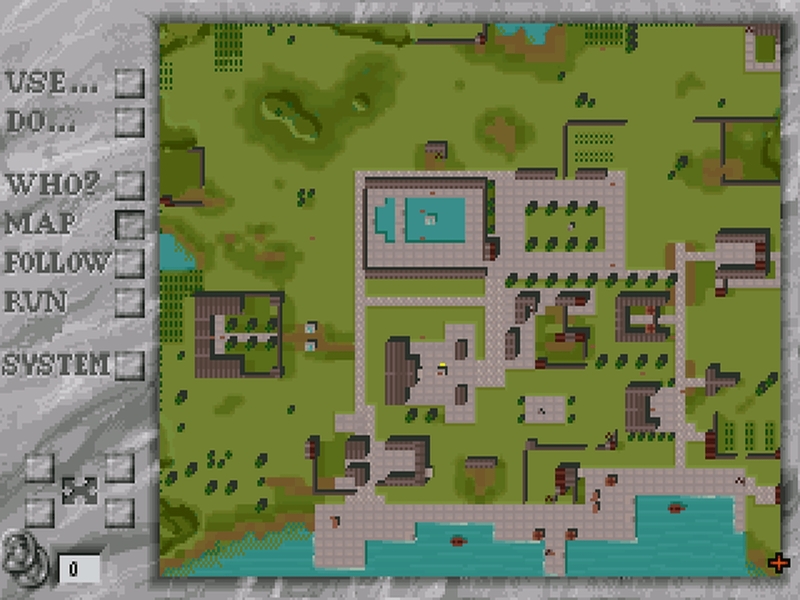 There's a map, but nothing's labeled and I don't know where anything is or even what's useful, so I guess I'll have to start out just wandering around and see what I can find, reloading if I run out of time and the lava engulfs the town. Speaking of the town, it's supposed to be Herculaneum in AD 92. However, any quick search will tell you that the eruption of Mt. 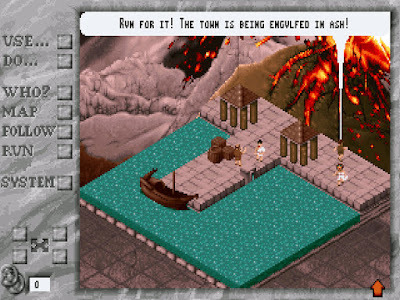 Vesuvius that destroyed both Pompeii and Herculaneum happened in AD 79, so the game starts out right away being historically inaccurate by thirteen years. We'll see how other historical aspects stack up. If you want to play along, the game is available for download in multiple places and can be played online on the Internet Archive. And an observation, from these screen shots: I like that they made the obvious pun of using chiseled letters in their speech bubbles (the city is ENGVLFED in lava) and with the RVN and VSE buttons. A nice tovch. Yep. I actually didn't even notice that with the menu font, but it's a lot more obvious in the speech bubbles and other descriptive text. I have fond memories of this game, even though I never managed to see the end of it. I felt the game was really immersive (for its time), but I don't think it will fare well as an adventure game, maybe even worse than Dune on this respect. Thus I'd give it a XLII rating. The Adventures of Robin Hood I have a vague memory of trying to play once, and not getting anywhere. It doesn't appear to be on the CRPG Addict's master list, so it may be more action than RPG, even. I remember seeing this game briefly at a friend's house in junior high. I recall the volcano at the beginning, but I didn't see him progress beyond that opening section. I don't know if he ever finished it. Put me down for XXXVII. "We'll see how other historical aspects stack up." I think the premise itself is pseudohistorical, as I am pretty sure no Roman emperor was called Hector. Isn't Hector a Greek name? Trojan champion, Greek name, yes, you're right...but Rome stole so much from Greece that I'm sure they stole names too. That's hardly an inconsistency worth caring about when the story's not even set in the right year. Actually, he may well have been Greek. I was doing a little reading on Pompeii which suggests that the slaves of Pompeii were from all sorts of places including Africa and Greece. Too bad it was V years before Google could have helped him with his historical facts it seems. The interface looks good at a glance, and since I have a soft spot for isometric views I will go with XLV, Reiko is not going to be impressed when she has to do the closest score bit in the final post. A simple XL here. And big thumbs up to Michael for starting the score guessing in style! Hoc ludum est turbatio et quod non expectata. Et vaticinor trigintaquinque. Ave Caesar! Thirty days? Did Google translate that right? Or is that your score guess? "Score" just means "a set of twenty", it's not time specifically. It's still used in modern language more loosely to mean "a lot" ("I have scores of things to do today"). Maybe Latin has a habit of referring to groups of days by just naming the number of them?